A fourteen-year blogging veteran, she is the voice behind Awesomely Luvvie, a widely-respected humor blog that covers everything pop culture – from TV, movies, and technology to travel, race and life’s random adventures. It was her blog that inspired Luvvie’s debut book, “I’m Judging You: The Do-Better Manual,” which was released in September 2016, and instantly hit the New York Times best-seller’s list. It is a collection of essays that critique our fame-obsessed, social media-centric lives while encouraging us to do better. The book is the good, yet snarky, angel on your shoulder, in word form. The drive to leave the world better than she found it is the foundation of her work with The Red Pump Project, a nonprofit she co-founded with Karyn Brianne Lee. Since March 2009, Red Pump has empowered women and girls of color about HIV/AIDS. 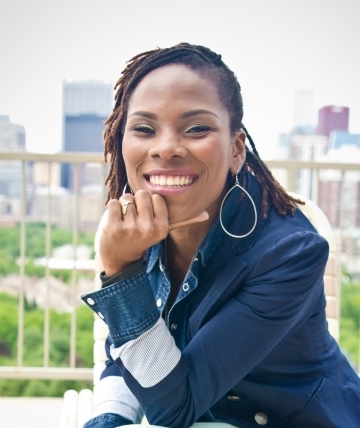 As Executive Director, Luvvie leads a national organization that is committed to empowering and driving the conversation to decrease the stigma associated with the HIV epidemic. Red Pump’s work has earned them a Congressional Record from the U.S. House of Representatives and Resolutions by the Illinois State Senate as well as the City Council of Chicago. Luvvie’s work as a culture critic and activist have brought her much acclaim. She was selected as a part of Oprah Winfrey’s inaugural Supersoul100 list in 2016, as someone who “elevates humanity.” She was voted as the Influencer of the Year at the 2016 Iris Awards and was chosen as a 2015 Black Innovator by XFINITY Comcast. She is also a past winner of the Women’s Media Center’s Social Media Award for using her voice and humor for pop culture critique and gender and racial justice. For availability and speaker fees, please contact Luvvie Ajayi’s speaking agent at Chartwell here, or call +1 972 385 1021 for U.S. inquiries or +44 207 293 0864 for international inquiries.